You will never think Thai rice is boring again. In Thailand, rice isn’t simply a food, it’s a symbol of bounty and fertility – and a key part of Thai culture. It’s also the root of some bizarre rituals the average tourist will never see. Here’s how you can delve into some fascinating rice customs, festivals and rice dishes in Thailand. I was standing in the centre of Bangkok, but instead of the usual traffic jams and shopping stalls I was staring at two sacred white bulls yoked to a plow handle, four celestial maidens toting golden baskets and one Lord of the Royal Plowing Ceremony tossing rice kernels onto the earth. As the procession made its way around Sanam Luang Park just outside the Grand Palace, the ground was plowed by the oxen and the rice kernels were scattered. 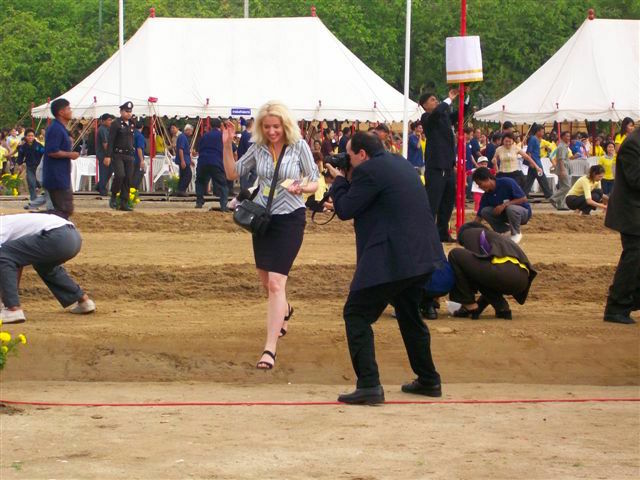 Royal Ploughing Ceremony, I joined the rush of local Thais racing to collect grains of rice from the ground. Racing in and out of the field in my tight skirt and flimsy sandals before the farmers could knock me over in their enthusiasm, I made off with my prize – six grains of auspicious rice from an event presided over by the Crown Prince of Thailand himself. My curiosity piqued by this sacred ceremony in Bangkok, I decided to travel deeper into the rice culture of Thailand to connect with the country’s culinary roots. Here’s how you can, too. In Thailand, rice is more than a staple food; it’s something to revere. Thai meals almost always have rice as an accompaniment, and the words ‘to eat’ literally translate as ‘eat rice.’ It has been grown for more than 5,000 years here, and was first cultivated around 3500 BC. Considering rice is Thailand’s most important crop, with 60% of Thai farmers cultivating it, it’s no surprise that rice is deeply ingrained in all aspects of Thai culture. A key provider of sustenance and nutrition for Thai people, rice has inspired myths, rituals and superstitions, and a number of celebrations are devoted to the rice crop and to asking the gods for rain for good harvests. Rice is also important to the country economically. 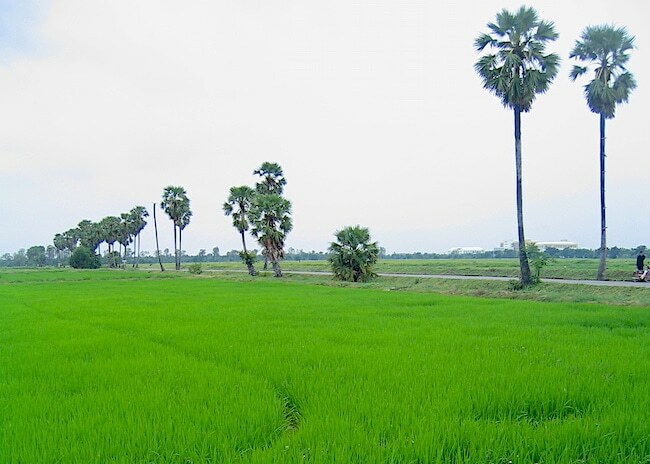 Thailand is one of the biggest exporters of rice in the world, and Thai rice is known for its quality. Offerings are made to the rice mother goddess, Mae Posop (or Mae Phosop), to ask for a good rice harvest for the farmers. The life cycle of the rice goddess echoes the growing season. When the rice begins to seed, Mae Posop is considered to be pregnant. At this critical time in the season, farmers put offerings such as bananas, citrus fruits or cane sugar in bamboo baskets and hang them in their fields. 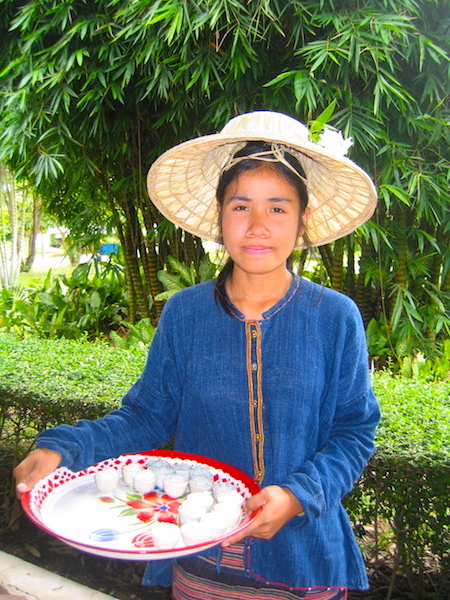 When the rice is harvested, different offerings are made such as boiled duck eggs, sweets and fruit. The main type of rice grown in Thailand is Hom Mali, a long-grained white jasmine rice that stands out for its sweet ‘popcorn’ fragrance, but there are actually more than 3,500 different varieties grown in the country. Some estimates go as high as 6,000. Other popular rice varieties include plain white long-grained rice; sticky rice (khao neow); brown rice (hhao dum), which is slightly crunchy, and Thai red rice. The latest superfood in the Thai rice industry is riceberry, which is a cross between purple rice and Thai jasmine rice. Developed in Thailand but making its way into supermarket shelves around the globe, this nutty-flavoured supergrain is said to be high in antioxidants and minerals. You could travel the entire country on the theme of rice alone. In northern Thailand, where sticky (glutinous) rice, reigns supreme, the Rocket Festival, Bun Bang Fai, is a raucous celebration that uses an explosive combination of bamboo and gunpowder to fuel homemade rockets, which are set off to ask the sky to send rain for the new season of rice growing. The biggest Rocket Festival takes place in the town of Yasothon at the beginning of the wet season in mid May, and is a lively three-day event with dancers, parades and music – and plenty of alcohol to fuel the fun. An intriguing rain ceremony is the Cat Procession in the central region of Thailand, Hae Nang Maew. A centuries-old tradition that only occurs in times of severe drought, the Cat Procession harkens back to Thailand’s animistic roots. Stemming from the belief that a crying cat can bring rain, the ritual consists of a female cat being paraded around in a basket while villagers throw water at it. One theory is that the cat represents ‘dryness’ and soaking it chased the dryness away. Another theory is that when the cat gets wet, it yowls, which is seen as a plea to the rain deity for rain. Wow. Who knew that exploring Thailand culture through its rice customs could be so fascinating? Now where do I get tickets for that? 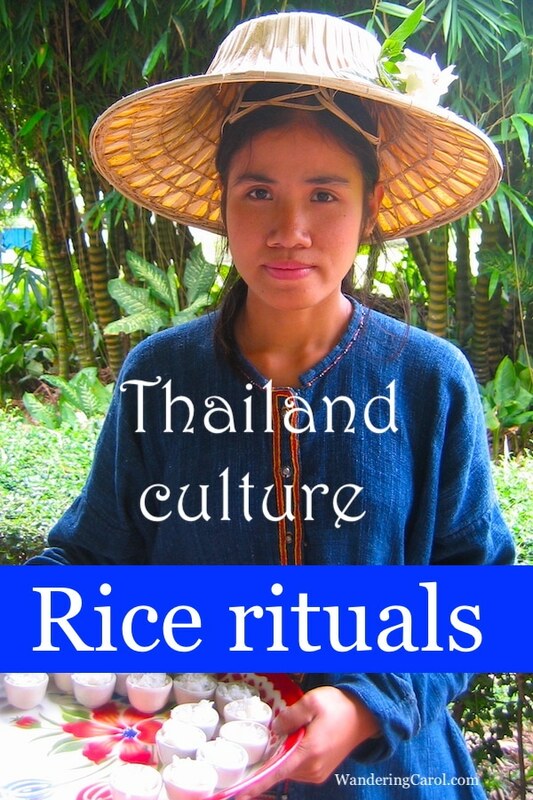 (Actually, when I first wrote about Thai rice rituals for the Toronto Star, someone did contact me inviting me to one of these mysterious rituals, but sadly (or maybe thankfully) I’d left Thailand by then. You’d be hard pressed to find a restaurant that didn’t serve rice in Thailand, but here are some standouts when it comes to the restaurant scene. At the Michelin-starred Siam Wisdom in Bangkok, you can add an order of Organic steamed riceberry cooked in coconut juice, or a Steamed Thai jasmine rice with jasmine flower in a clay pot to your meal. Check out their lunch specials for some good deals. At Err near Ta Tien Pier you can get urban rustic Thai cuisine that has deep cultural traditions. The restaurant works with local farmers and artisanal producers to source its fresh ingredients, and has perfected the art of in-house fermentation. A rice dish to try here is Steamed sticky rice or Egg-coated grilled sticky rice, or maybe a preserved Grilled northern style garlic and sticky rice cured pork. For fine dining in Bangkok, the Michelin-starred Saneh Jaan is a restaurant in the modern steel and glass Glasshouse Building in the financial district. This chic eatery combines contemporary tastes with traditional Thai ingredients such as holy basil, garlic vine and rosella flowers. Along with rice accompaniments to any meal it offers starters of Crispy rice crust and pineapple with sweet curried fish or a Rice cracker with minced pork and shrimp dip. Hugely popular is the Mango sticky rice dessert at Boonsap Thai Desserts. Opened in the 1940s, this long-standing dessert shop specializes in the iconic Thai dessert, Sweet Mango sticky rice, which is a combo of coconut milk, glutinous rice and mango. Yum. Another rice-based dessert to try is their Black rice flour pudding made by pulverizing burnt coconut fibre. Boonsap Thai Desserts is located at 1478 Charoen Krung Rd, Khwaeng Bang Rak, Khet Bang Rak, Krung Thep Maha Nakhon 10500, Thailand. Telephone: +66 2 234 4086. On Thailand’s biggest island, Phuket, the very hip and pricy Sri panwa resort is a hit with Asian celebrities and the ‘It’ pack. At the resort’s Baba Soul Food, where many of the produce is sourced from The King’s Royal Project organic farms of Northern Thailand, you can try a dessert of Crispy khao mao made from shredded rice grain and caramel coconut with warm milk. Note: Below are some affiliate links. In the posh surroundings and lush jungle locale of the Four Seasons Koh Samui Resort on the southern island of Samui you can opt for a Coconut Oil & Jasmine Rice Scrub to hydrate and nourish. In Phuket you can indulge with a Jasmine Rice Scrub at the upscale Andara Resort. In the very luxe and uniquely-designed Keemala Resort, you can opt for a Siam Botanticals Body Polish with Rosemary and Rice Bran Powder that balances, calms and exfoliates. Most luxury spas in Thailand’s capital are to be found in Bangkok’s best hotels, but there are exceptions. At Divana Nurture Spa, you can try a Phikat Bua Prakob Remedy that includes a rice wine body soak. At the swanky Banyan Tree Spa you can buy Jasmine Rice Facial Collection skin products that contain vitamin E, jasmine extracts and rice ferment filtrate, a fermented product that is supposed to moisturize, detoxify and soothe. Rice in Thailand may be part of its ancient food culture, but what’s old is new, and rice is gaining more momentum in the health department. Scientific studies about rice have shown that brown rice may have anti-diabetic, anti-cholesterol, heart protective and antioxidant properties, and that rice bran, the brown outer layer of the rice kernel, contains more than 100 antioxidant compounds. The most powerful antioxidant in rice is gamma oryzanol, a plant sterol that promises to lower cholesterol, reduce menopausal symptoms and is poised to be the new “it” weapon in our anti-aging tool kit. Just keep in mind that to get the most benefits from rice you’re going to have to opt for something other than Thailand’s delicious jasmine white rice. Sigh. But it’s also possible to get brown jasmine rice. And don’t worry, there are plenty of other colours to choose from: yellow rice, green rice, blue and even purple rice. Purple rice, for example, which gets its colour from the pigment in the husk, has long been used as a traditional herbal remedy and is said to reduce cholesterol and atherosclerosis. The benefits seems clear. 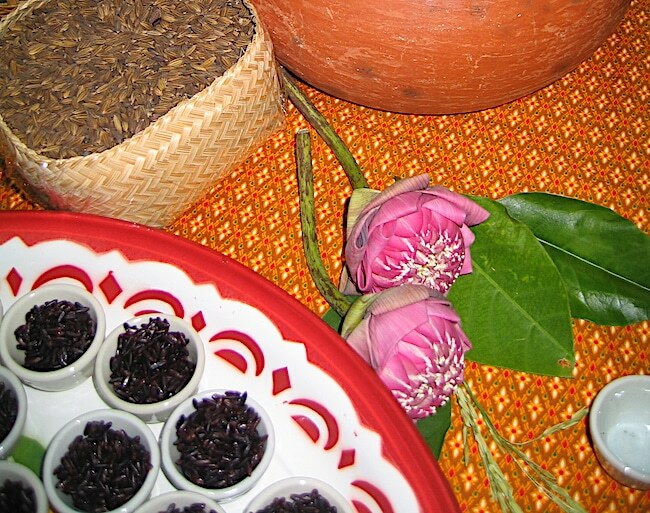 Whether you eat rice, exfoliate your body with it or conduct some mysterious bizarre rice rituals of your own, think of Thai rice as a journey deep into the roots of Siamese culture, and thank the rice goddess, Mae Posop for providing such a bounty.